With plenty of moving services, Meathead Movers is fully prepared to make Port Hueneme your new home. Our clean-cut student athlete movers are dedicated to fulfilling all your moving needs efficiently. Welcome to Meathead Movers Serving Port Hueneme! If you are moving to or from anywhere in Port Hueneme, CA, we are the moving company for you! Our professionally trained student-athlete movers and our moving concierge service are here to help you with every stage of your move in Port Hueneme. The beautiful seaside community of Port Hueneme is a great place to call home. With the Naval Base of Ventura County located within the city, there are plenty of employment opportunities. Port Hueneme’s harbor also brings a lot of economic prosperity to the city. For nature lovers, the city has a 50-acre beach park that even has a fishing pier, BBQ areas, and volleyball nets. 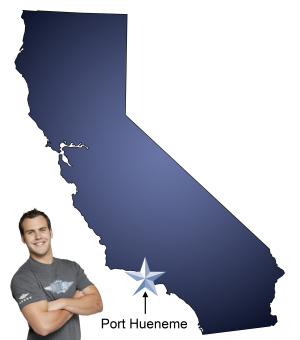 If you are considering a move to this friendly city by the sea, Meathead Movers is here to help! Our moving company specializes in local, long-distance, and commercial moves to, from, and within Port Hueneme. We also provide reliable packing, storage, on-site relocations, and our distinctive moving concierge service, which connects you with local service providers. All our student-athlete movers are thoroughly screened and trained before their first move. With branches not just in Port Hueneme, but all throughout California, we are your one-stop resource for all your moving needs, no matter where your California move takes you. In fact, you can see what your neighbors in Port Hueneme have to say about us. With our 100% satisfaction guarantee, the only thing you have to lose is the stress that comes from moving! Contact us today for a free no-obligation moving quote and to learn how we can help you on your next move! Moving to Port Hueneme? Here are some helpful resources. View more Port Hueneme resources. Your movers are extremely courteous and try to protect the furnishings as much as possible. They move through the move as quickly as they can and always keep you apprised of the status of progress. If any issues come up (furniture that won’t fit easily through doorways, for example) they will always take the time to resolve the issue expeditiously without damaging either the furniture or the walls or flooring. Great team! Ensure field team knows all items to move. If uncertain, field team should call to confirm. Thank you for your help in packing our house so we could move. You made this stressful process for us a stress free experience. We cannot thank you enough for everything you have done. I liked how there 4 guys who could professionally move my stuff using teamwork in a timely manner.